Ms. Munich, BSB Clm 6298, also known as the Homiliary of St. Korbinian, is one of the somewhat elusive pieces of the digital collection of the Bayerische Staatsbibliothek that I came across recently. 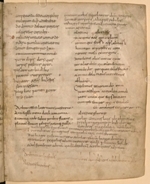 According to the Katalog of Bernhard Bischoff, it is a late eighth-century exemplar of the homilies of Caesarius of Arles (and others) produced in clear Anglo-Saxon minuscule. The locus of its origin remains a mystery. Some of the continental centers with well-known Anglo-Saxon presence have been suggested based on the paleographical evidence, among them Fulda, Mainz and Würzburg. Katharina Bierbrauer pointed out similarities in the script with a group of manuscripts from the Würzburg school and this seems to be the most recent assessment of the origin of this piece. The manuscript found its way to the cathedral library of Freising by the twelfth century, but its earlier whereabouts remain a part of the puzzle. This much for introduction. But what else lurks in this Carolingian codex? 1. Quattuor turbas sequebantur dominum. Una propter sanitatem corporis. Alia propter fabulas. Tertia propter reprehensionem. Quarta propter vitam aeternam. 2. Corban. communis locus ubi aelimosinae populi congregantur inde aluntur sacerdotes. Of these, the second is particularly interesting, and I will start with it, as it has a direct parallel in the so-called biblical commentaries from the Canterbury school edited and discussed by Bischoff and Lapidge. The two glossographic notes can be found in their edition as consecutive items 58 and 59 in the so-called second batch of the gospel glosses (EvII) from the Canterbury school. The Canterbury commentaries are believed to go back to Theodore and Hadrian, two scholars imported from Italy to Anglo-Saxon England in the second half of the seventh century, who are mentioned by Bede and their student Aldhelm and whose names pop up now and then attached to an enigmatic glossographic piece or a recipe. Bischoff and Lapidge studied the duo extensively and came to a conclusion that some 25 manuscripts preserve portions of a commentary corpus on majority of the books of Bible which likely started as notes taken from the viva voce lectures of the two scholars i late seventh-century England. Eventually, these commentaries-notes boiled down to chains of exegetical glosses and short notices available in the continental Anglo-Saxon mission centers. Fragmented batches of glosses from the Canterbury commentaries were, so far, found in eighth- and ninth-century manuscripts from St. Gall, Bavaria, and Anglo-Saxon centers in Germany. The only younger manuscript is an eleventh-century Italian manuscript Milan, Bib. Amb. M 79 sup., which is also the most substantial depository of the commentary material and basis of Bischoff’s and Lapidge’s edition against which the other, older manuscripts can be measured. Corban. communis locus ubi aelimosinae populi congregantur inde aluntur sacerdotes. The parallelism is quite blunt and given the order of the glosses as well as the fact that the material from the commentaries was by no means wide-spread in the late eight century or later nor that it spilled substantially into other glossographic texts, Clm 6298 seems to be (yet another) witness for the transmission of the commentary material on the Continent. Neither Würzburg 47 nor Clm 14470 can be linked in any direct way with Clm 6298, not surprisingly. In the same way, we cannot know whether the glosses were inserted into the homiliary in its original place of production, in an unknown other location via which it passed, or say in Bavaria where it eventually landed. Our only hint is that, given the position of the notes in the page, they have been inserted after the cluster of marginalia made by one Amalricus who signed his work (Amalricus scripsit. Amen). Bischoff dates the writing of this Amalricus to ninth century, but makes no comment about the dating of this other hand. In his Die südostdeutschen Schreibschulen, he hypothesizes that this Amalricus might be identical with a subdeacon of the same name who is attested in Freising in 827, but whom Bischoff believes to come from north rather than to have been trained in Freising, thus potentially the person who carried the manuscript south. I hoped that the other two excerpts that seem to have been entered together with the glosses could provide some more detail about when, where and how the Canterbury commentary material was entered into Clm 6298, but I had so far little luck with them. I present few of my findings here, nevertheless. VIDENS AVTEM TVRBAS, ASCENDIT IN MONTEM. Quattuor autem turbe Dominum sequebantur, id est turba discipulorum et alia turba, quae ueniebat sanitatem corporis accipere, et tertia, ut elymosinam acciperet ab eo, et quarta ad hoc tantummodo uenit, ut eum in aliquo deprehendere potuisset, sicut scribae et Pharisei. Even though the content of the excerpt in Clm 6298 is slightly different from what can be found in Clm 14311, both have a similar structure, use similar vocabulary (particularly the term reprehensio–deprehendere) and display a distinct enumerative quality, which has a distinct Insular ring to it. Bischoff believed that this commentary was of Insular origin, while Löfstedt considered both Insular and Roman origin possible. I would suspect that there might be other Insular material akin to the excerpt no. 1 in Clm 6298, but unfortunately, I was not able to pinpoint it. Duo in lecto illos figurant qui remoti a turbis in otio quodammodo vitae vacare videntur.Duae molentes illi intelliguntur qui negotiis temporalium rerum circumferuntur. Duo in agro, illi sunt qui in ministerio Ecclesiae, tanquam in agro dominico, operantur, ex quibus, adveniente nocte, id est, saeculi adversitate, quidam permanent in fide, et assumuntur ad vitam, quidam discedunt, et relinquuntur ad poenam. Duo in lecto illi significantur qui remoti a turbis in otio quodam vitae vacere videntur, duo molentes qui negotiis temporalium rerum circumferuntur, duo in agro qui sunt in ministerio eclesiae, tanquam in agro dominico operantur, ex quibus adveniente nocte quidam permanent in fide, et assumuntur ad vitam quidam decidunt et relinquantur ad poenam. In sum, ms. Munich, BSB Clm 6298 is an unexpected fourth witness to the second batch of the gospel glosses from Canterbury commentaries (EvII) in the area north of Alps and in the period of the eighth and the ninth century. It is also certainly one of the older witnesses of the material, and quite accurate as it seems. To add, Clm 6298 is the only manuscript other than the eleventh-century Milanese copy of the commentaries that preserved one of the two glosses to Matthew, and one that preserved the second gloss in a shape slightly better than the Würzburg gloss batch. Meanwhile, the hunt for critters continues and you may hear more of what is hidden in the Bayerische Staatsbibliothek. K. Bierbrauer (1990), Die vorkarolingischen und karolingischen Handschriften der Bayerischen Staatsbibliothek: Textband. Wiesbaden. B. Bischoff (1940), Die südostdeutschen Schreibschulen und Bibliotheken in der Karolingerzeit. vol. 1. Wiesbaden. B. Bischoff & M. Lapidge (1994), Biblical commentaries from the Canterbury school of Theodore and Hadrian. Cambridge. B. Bischoff (2004), Katalog der festländischen Handschriften des neunten Jahrhunderts (mit Ausnahme der wisigotischen). Teil 2: Laon-Paderborn. B. Ebersperger, ed. Wiesbaden. G. Glauche (2000), Katalog der lateinischen Handschriften der Bayerischen Staatsbibliothek München: Die Pergamenthandschriften aus dem Domkapitel Freising: Bd. 1. Clm 6201-6316. Wiesbaden. M. Lapidge (1986), ‘The School of Theodore and Hadrian’, Anglo-Saxon England 15 (1986), 45-72. M. Lapidge (2005), The Anglo-Saxon library. Oxford. B. Löfstedt (2003), Anonymi in Matthaeum. CC CM 159. Turnhout. J.D. Pheifer (1987), ‘Early Anglo-Saxon Glossaries and the school of Canterbury’, Anglo-Saxon England 16 (1987), 17-44. Bischoff (2004), no. 3036a; most recently also in Lapidge (2005), p. 160. See Glauche (2000), p. 171. Lapidge (1986), pp. 56-57; Bischoff & Lapidge (1994), p. 267. Bischoff & Lapidge (1994), p. 291. The overview of the three manuscripts can be found in Bischoff &Lapidge (1994), pp. 289-290. At: http://vb.uni-wuerzburg.de/ub/permalink/mpthf47. Bischoff and Lapidge consider it an early ninth-century manuscript. At: http://daten.digitale-sammlungen.de/bsb00046484/image_14. Another exemplar of Allegoriae from the same period can be found in ms. Wolfenbüttel, Herz. Aug. Bib. Cod. Guelf. 87 Weiss. (second half of the 9th c., Weissenburg?). At: http://diglib.hab.de/mss/87-weiss/start.htm. The relevant passage features in f. 135r, but is not as close as the one in the Munich manuscript. CITATION: Evina Steinova, Carolingian Critters: Munich, Clm 6298, in: Mittelalter. Interdisziplinäre Forschung und Rezeptionsgeschichte, 16 January 2017, https://mittelalter.hypotheses.org/238.